Payment reform. I put this first because no matter what form or structure healthcare takes, without payment reform it will be doomed to failure. And by “payment reform” I mean switching from the “fee for service” model I discussed in an earlier column – which basically pays more for doing more whether or not it is needed – to some kind of “outcomes” payment system. There are many “outcomes” payment ideas – bundling, global, etc. – but they are all designed in theory to force providers to live within a certain budget for a given patient. Obviously, this is a huge culture change and will require many years – and many mistakes – to figure out. Electronic records. While I recognize there are many issues (privacy, compatibility, etc.) to be yet worked out before electronic records can become near universal in our hospital and personal healthcare, I believe it will be impossible to intelligently cut costs and improve safety without them. Imagine, again, the U.S. commercial airline industry in this country without computers able to “talk to each other” with the same language no matter the location. Comparability data. And once such a computer system is widely in place, we can start making better use of “outcomes” data – i.e., data from studies that tell us what works best at the lowest cost. Another name for this would be “cost effectiveness” data but those two words strike fear – understandably – in the hearts of doctors and patients who assume that means choosing the cheapest option regardless of quality concerns. Right now there is a paucity of such data – in part because the “medical industrial complex” has often fought true comparison studies. But the need for such data will only grow as cost issues become paramount. Primary care. Ultimately, all of the above will only work well in the setting of good primary care – meaning a place and professionals readily available, at least by phone, when a person thinks they (or a member of their family) might be sick. The phrase so often used to describe this “place” today is “the medical home.” Obviously a “medical home” – like any home – can physically exist in many different kinds of settings ranging from a traditional office to a clinic to a setting in a hospital. But the key ingredients of such a home, in my judgment, are the traditional three A’s: availability, affability, and affordability. Timothy Johnson trained as an emergency room physician but switched careers in 1984 when he joined ABC News as its first full time Medical Editor. Although he retired from that role in 2010, he continues as Senior Medical Contributor. He blogs atTimothy Johnson, MD: On Health. The creation and widespread use of the iPhone has impacted many industries, and now has affected Medicine in many ways. In manycases the iPhone applifies the power of the device to which it is attached by its computing power. In some, it uses it powerful photographic and optic powers to affect change. We will examine the Top Ten Medical Uses that we feel has, and will have, a deep impact on the practice of healthcare. 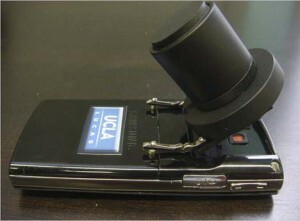 The Otoscope using the iPhone is also called the Remotoscope, and sometimes Cellscope. The versatile ole iPhone is used to, not only view the inner ear with magnification, but also take pictures, to send to doctors, or specialists, from home or remote areas. It is approved by the FDA. 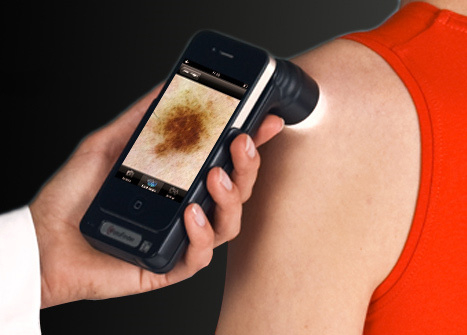 This is yet another use of the iPhone as a periperal device useful in Internet Medicine. Just recently approved by the FDA (December 2012) the iPhone ECG is a single-lead electrocardiogram reader that attaches to the back of an iPhone and displays heart rate info via an app. (An Android version is in the works.) The creator, Dr. David Albert, is an Oklahoma Cardiologist, who likes to be called an “Inventor”. Son of former Speaker of the House, Carl Albert, David believes the iPhone ECG could be used in intensive care units and used by EMTs. His team is recently compiled data in June 2012, after which his company received more funding from the powerful Qualcomm, a big company in the wireless industry. 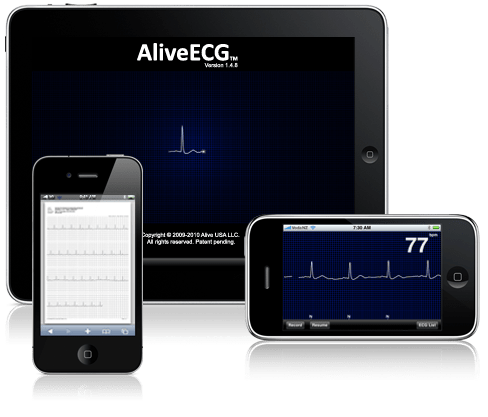 Basically, a peripheral device, projected to be around $100, is attatched to any Smartphone, and a real time, a high quality one lead EKG can be done. This EKG can be done anywhere a Smartphone goes, and allows for rapid, quick assessment of some cardiac problems in the field, including rhythm disturbances. To truly diagnose a full MI, however, the AliveCor is not able, since it does not give a total picture of many leads. A full EKG is indicated as Dr. Albert maintains to truly diagnose an myocardial infarction. Additionally, its’ low cost also allows for mass screening in developing countries. And like any wireless device, one is allowed to transmit any questionable EKG to any other Smartphone, which allows for in-the-field consultations with cardiologists, which are relatively scare in developing countries. The thrust of this well-funded company is global. The company has moved to San Francisco. AliveCor’s ECG device basically enables medical professionals and regular consumers to monitor a person heart health. 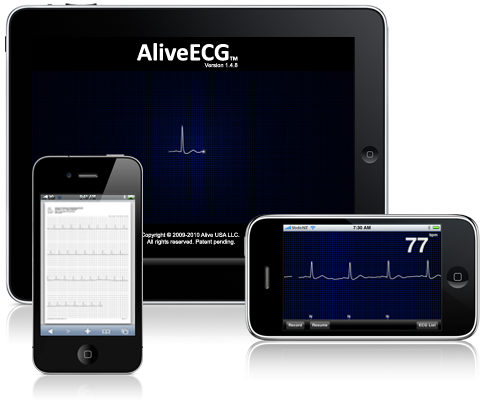 Its cardiac monitoring technology is designed to work with the iPhone, iPad and Android devices. One has to stop thinking of the iPhone, Android, Blackberry as a phone, when dealing with its place in Internet Medicine. It, rather, should be thought of as a powerful mini-computer, with a state-of-the-art photo equipment. Yes, that little thing. It can be converted to a powerful, picture-taking camera, to act as a supremely useful peripheral device. Of course, this would not be neeedd in most labs, but in rural area, in underdeveloped countries, it would have unlimited potential. No phone connection is needed, simply the peripheral and the smartphone without an internet connection. Of course, a connection would be needed if the image is sent to other parts of the world to be interpreted. The device will prove to be invaluable in underdeveloped countries where cost and distance are now problems to diagnose the common infectious disease in the Third World. Basically, there is a combination of finding the right economical lens, and developing software to work with the image. The aim in underdeveloped countries is the diagnosis of infectious diseases, TB, malaria, and other microbes. Above , in the top row, are images of pollen seen under a normal microscope. Below are Smartphone images. This is included, not only for teaching purposes, but because it is beautiful and colorful, and it might break the page up a bit. The miraculous thing about smartphones and the use of the microphone, is that is shows the unlimited, fantastic potential of using portable computers for use in the field, in uses which will be tremendously exiciting, and useful in the healthcare field throughout the world, and will undoubtedly find niches heretherefore unreached. Whew, I love using that word “heretherefore”. What is called a “Killer App” will be the creation of a non-invasive way to measure serum glucose. That day has not arrived yet, at least none has been approved by the FDA, but that day will soon come, andALTAPURE says they will be the first. Until then, we have peripheral devices as on this page. IBGStar is a blood glucose meter plug-in for the iPhone There is a an iBGStar Diabetes Manager App that tracks blood glucose, carbohydrate intake, and insulin dose.The benefit of this peripheral is to manage your regimen of care of the diabetes, by posting alerts, keeping log, etc. Finger sticks with the lancet are still required. There are other devices on the horizon of the digital revolution that will avoid being stuck to check glucose. 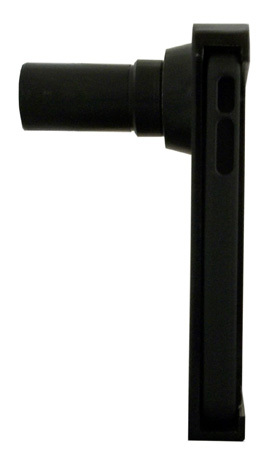 From Germany, we have the development of the “Handyscope”, or Dermatoscope, which is a case that fits snugly over an iPhone, and takes up top 20x magnification. It also has accompanying polarized light to better show the skin lesion. easily save the picture, send it to a collegue by email, or send it to the desktop. This groundbaking mobile, wireless, portable ultrasound is sure to find widepread use in all medical settings across America, and the world. And it is inexpensive, which will lead to even wider use, especially in rural and third-world areas. This device will find widepread use in Emergency Rooms, and in the surgical and medical wards, as well as in office practice. Of course, there will be times when a higher grade ultrasound will be needed, but this Smartphone Ultrasound is a great start for diagnosing all types of medical problems, as a screening device., for medical conditions such as vascular problems, gallstones, kidney stones, abdominal masses, and other problems. This invention will be brought to areas that could not afford it, or live in inaccessible areas. The above model is a Mobisante, which is the world’s first smartphone-based ultrasound imaging system, the MobiUS™ SP1 ultrasound system. 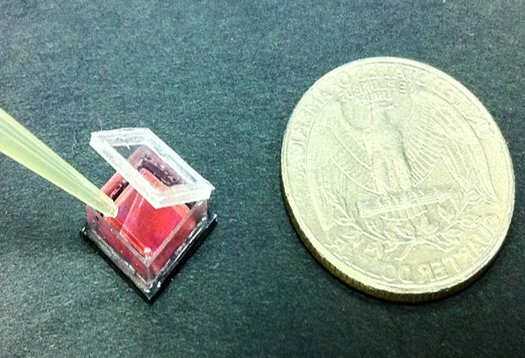 This device has been approved by the FDA is made to order to reduce healthcare costs and improve diagnostics in areas that cannot access imaging centers..
At Caltech, engineers have created a device, that aids in the process of identification of micro-organisms, with the Petri Dish process. 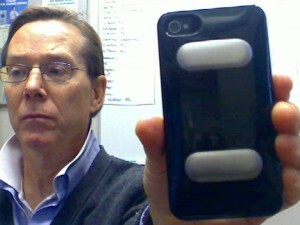 The iPhone is used, along with a Lego Frame, to read the Petri Dish in real time, after it is put into the incubator. 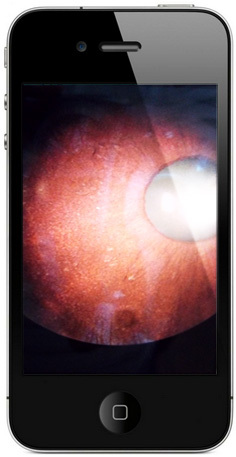 The above shot from aniPhone is looking at the back of the eye, at the all-important retina, a frequent site of pathology, especially for diabetics. Again, one can take pictures of the images seen through the slit lamp, and send them anywhere there is internet, which one of the principles show by this device. Minicomputers getting stronger, and more work-outsourced to patients, in the future. This iPhone peripheral blood pressure cuff, does readings, and the app is programmed to record the readings, time of day, and keeps a log. Also allows you to send your record to whereever you wish, including to your doctor. This device allows a truer measure of blood pressure, avoiding “white-coat hypertension” or having falsely high readings at a doctor’s office. The important part of a device such as this, is that allows for neat, easily retrievable records to be kept, made into graph forms by the software, and will make the patient more concious of the trends of the blood pressure. There is also the option of using Microsoft® HealthVault™ , which keeps all your health records in one place. iPhones will soon take the place of the spirometer. 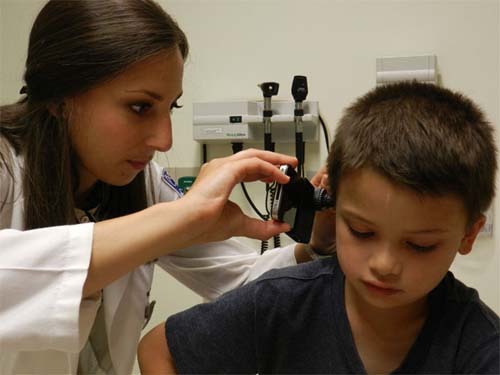 At the University of Washington Medical Center, an iPhone App has been developed to make an algorithm with the audio portion of an expiration, and there is a 5% difference in studies performed, compared against the ole spirometer. This sprirometer is based on the same principles of work that is being done on the early detection of Parkinsonism, based on the sound waves generated by a persons voice on the phone. 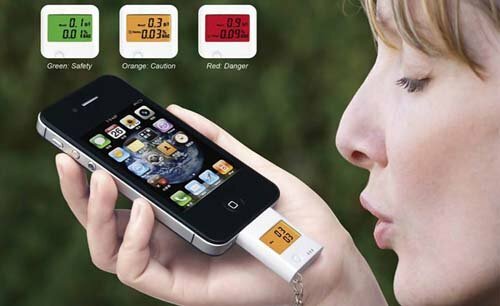 Another use of the iPhone is used with a peripheral used as a breathalyzer, to detect alcholo levels, from your expiration. Could help with avoiding drunk driving. See slideshow to see how it looks on the iPhone. At the University of Demark, research is being conducted on using the Smartphone, along with specially programmed software, and a specialized headset, to do portable, mobile brain scans. Of course, it is just in the beta stage, but goes to show the potential of this powerful little computer, known as a Smartphone. Source code and additional information is available on the smartphonebrainscanner2 project website. Le “classifiche” degli ospedali diventano una cosa seria. Straordinario post di Ashish Jha sul suo blog “An Ounce of Evidence”. Medico, ricercatore di politica sanitaria, Ashish Jha sostiene il concetto che un’oncia di dati vale molto di più di migliaia di libbre di opinioni. Il post riporta i dati sulle “classifiche” degli ospedali da parte di tre organizzazioni: The Leapfrog Group; Consumer Reports; US News & World Report. Analisi molto approfondita e commenti immediati da parte di Consumer reports e The Leapfrog Group. Anche in Italia il programma nazionale esiti di AGENAS e la partecipazione di alcune Aziende Ospedaliero-Universitarie ( al momento Udine e Verona ) a Global Comparator di Dr Foster va nella giusta direzione. In a previous post on the Social Media Healthcare blog, I made an argument as to why physicians should be involved in social media—especially on Twitter. The purpose of this post is to describe how I use social media as a busy clinician and teacher of family medicine to keep up to date with clinical and policy information and also how I find the time to use social media. Yes, social media can fit into a busy schedule. One of the most daunting challenges facing any newcomer to social media is the volume and scope of information that is available. Once one starts following other social media accounts, the incoming “stream” of information can quickly become overwhelming. A number of social media participants have likened it to drinking from a firehose. In many cases, these streams of information are also not uniformly useful: friends’ updates may be personally important, but can make it harder to find relevant clinical or policy information. It can also become quickly apparent that trying to keep up with every update on Twitter or Facebook is an exercise in futility and will take up the better part of your life. Stop trying to read every update. Early on, when I was new on Twitter, I would try to read every single update posted and visible in my timeline. This took a ridiculous amount of time. Instead, I have come to understand that I cannot read every update. Instead, when I log into my accounts, I’ll glance at what updates are there and look back a bit at previous updates. I trust that anything that is really important will be shared or commented upon more than once, and I have come to appreciate the randomness and serendipity associated with dipping my toe in the stream every now and then. Organize your incoming information: this is one of the most valuable tricks that I have found. Instead of trying to search my overall Twitter feed (I follow nearly 1,500) accounts, I have created lists that allow me to focus on certain themes. I have a list for updates regarding health policy,clinical updates, family medicine-specific accounts, people in Richmond, etc. Perhaps the most useful is the list I’ve titled “essentials”: this list includes accounts that have an especially high value for me whether it is because of the quality of material they share, the topics in which they are interested, etc. When I have only a short window of time, I can skim the essentials list and get high quality information in short order. Given that I use social media as myself and as administrator for a few organizational accounts, this list lets me find information I can share from various accounts. Use time wisely. Each social media user has different times of day when they might review their accounts: over breakfast, at lunch, etc. However, you can make use of “interstitial time” (credit toPaul Tatum). If you have a computer or mobile device available, you can glance at your stream during the time that you’re waiting for the nurses to room a patient, or if a patient no-shows. These short windows of time can add up. Look into using a third-party Twitter client, such as TweetDeck or HootSuite. Twitter clients allow you to better organize the incoming information, and let you see multiple lists simultaneously. If you are sharing information, Twitter clients also allow you to share on different platforms (Twitter, Facebook) and via different accounts. This is a tremendous time-saver. I am not beholden to any particular client: I use TweetDeck on my laptop, HootSuite on my mobile devices, as it seems to be a better fit for them. Leverage your e-mail newsletters. If you subscribe to any e-mail newsletters, you can use them to find resources that you can then share to your account’s followers. For example, the American Academy of Pediatrics Smart Brief includes short capsules of useful information. You can read the capsules, click to read the full article, and then share that directly to your social media accounts. This prevents you from duplicating work, and allows others to see information you found to be relevant. You can do the same with Physicians First Watch, and numerous other sources. Finally, if you do not have much time to be on social media, look for relevant Tweetchats. These live online conversations are identified by a “hashtag” (i.e. #hcsm stands for healthcare communications and social media; #MedEd represents medical education, etc.—find a full listing here), scheduled at a pre-set time and day, and bring together a number of individuals and organizations with shared interests. This can be an efficient way to make new connections, and to share information that can benefit the community of users. In summary, do not be afraid that being on social media will inundate you with useless information and eat up any and all free time. There are ways to compress and increase the efficiency of your social media use to ensure that you find what you want to find, share what you think is relevant, and make meaningful connections with other users. How do you find balance between work and social media? Mark Ryan is a family physician who blogs at Life in Underserved Medicine and The Doctor’s Tablet, where this post originally appeared. CDC’s Guide to Writing for Social Media [PDF – 1.57 MB] – CDC’s Guide to Writing for Social Media was written to provide guidance and share the lessons learned in more than three years of creating social media messages in CDC health communication campaigns, activities, and emergency response efforts. In this guide, you will find information to help you write more effectively using multiple social media channels, particularly Facebook, Twitter, and mobile phone text messaging. The guide is intended for a beginner audience, although some readers with an intermediate level may find it useful too. Additional reference detailing CDC-specific security information related to social media is included in the following document developed in conjunction with the Office of Chief Information Security Officer (OCISO). The first half of 2012 has been an incredibly busy and momentous one for healthcare. Most notably, the Patient Protection and Affordable Care Act was upheld by the Supreme Court. Other events this year impacting the industry may not have been as closely watched, but they were certainly numerous and far-ranging. From the battle over the Medicare sustainable growth rate for physician payments, to the naming of more than 150 Medicare accountable care organizations, to the release of CMS’ meaningful use stage 2 requirements, the changes announced for the industry so far this year are significant. Yet, the year is far from over. As we move to the second half of 2012, here are six key issues to watch. 1. Healthcare reform. Now that the Supreme Court has ruled the PPACA largely constitutional, this leads to several interesting questions for the second half of the year. Will the implementation of the law move quickly? Will the declaration of the Supreme Court that the individual mandate included in the Act is in effect a tax have an impact on the presidential election? Will the decision that the Act is constitutional give new legitimacy to President Obama in the face of the independent and the middle of the voting public? How much will this issue strengthen the resolve of the Republican party? Will it matter? How will funding of much of the Act be achieved, especially if Republicans take control of the Senate? Healthcare certainly seems to be a key issue in campaigning, which could lead to an absolutely fascinating election. Becker’s Healthcare is pleased to be hosting a debate on healthcare reform and the election featuring former Democratic presidential candidate Howard Dean and former press secretary for George W. Bush Ari Fleisher at the19th Annual Ambulatory Surgery Centers Conference to be held Oct. 27-29 in Chicago. 2. Integration of healthcare systems in preparation for risk products. Certain healthcare systems have gotten well ahead of others in preparing for risk products on the commercial side. A great question revolves around how much of an advantage these systems will have in the market and how quickly will the acceleration of risk sharing products happen. For example, while the country remains largely fee-for-service, will the acceleration lead to a tipping point where there is a much quicker movement towards alternative methods of delivering/paying for care? We expect integration and the role of health systems in taking on risk to be a topic of discussion at the Becker’s Hospital Review Annual CEO Strategy Roundtable to be held Nov. 1 in Chicago. The event features a panel of 12 outstanding healthcare leaders, including Charlie Martin, CEO of Vanguard Health Systems. For more information on the event, click here. 3. Impact on consolidation. The pace of consolidation of independent hospitals and practices had vastly accelerated over the last few years. In 2011, 86 hospital merger or acquisition deals occurred in 2011, the highest number in the past decade, according to data from Irving Levin Associates. The uncertainty of the Supreme Court decision is expected to have caused a slight slowing of consolidation efforts. The question now is whether the decision will cause further acceleration of consolidation, particularly with smaller hospitals and with practices. 4. Investment in healthcare. Over the next few years, we expect there to continue to be tremendous interest in investment in healthcare. Aging of the baby boomer population is expected to drive demand for a variety of healthcare services and products, and if the expansion of health coverage called for by the PPACA does indeed come to fruition, the newly insured are expected to further positively impact volumes. Despite the consolidation of healthcare that has and is anticipated to occur, we have not yet see a reduced amount of opportunities for investment in healthcare. 5. Information system requirements. We continue to see health systems at all levels suffer in their ability to implement technology related to healthcare. Whether this is in the payor processing world or with regard to electronic medical records, it is not clear whether there is a systematic structural weakness or issues in the labor force that will not allow systems and companies to use the type of technology that has been so broadly encouraged by the government. It will be interesting to see whether there is sufficient talent needed to implement and run such concepts effectively. For example, in February, CMS released its proposed requirements for stage 2 of meaningful use under the Electronic Health Record Incentive Programs for Medicare and Medicaid. While the requirements are intended to improve interoperability and data exchange — both important elements for using electronic data to better coordinate care — many in the industry voiced concerns over several elements of the requirements, such as making providers responsible for patient engagement with their electronic health information. “Under pressure from cash strapped customers, including large employers, managed-care companies are increasingly focused on limiting their physician and hospital networks to rein in costs, and calling out doctors who rack up big charges. Analysts say the trend reminds them of 1990s-era managed-care strategies that helped constrain health spending, but that frustrated doctors and patients. With an eye on these six key issues, we are expecting an extremely interesting second half of the year.